She shall have music wherever she goes." For hundreds of years hobby horses, Jack in the greens, straw men and other similar characters brought life and colour to civic processions in towns and cities across the country. Many of them can be seen in carvings in churches locally.Four hundred years ago the Puritans not only destroyed Banburys famous crosses but rid the streets of these practices along with Morris Dancing and other ungodly festivities such as Christmas and football! At the beginning of the new millennium it was felt that time to reinstate these traditions; bring fun and splendour back into the life of the town hence on the first weekend of July 2000 Banbury's first Hobby Horse Festival and the first appearance of the fine lady on her white horse. The horse was made by sculptor Steve Rowley as part of a project involving local schools and funded by the Millennium Festival Awards for All Fund. She is now available for appearances at events in and around Banbury and can be booked by contacting us. Dressing up in animal disguises is an activity which is widespread across many cultures worldwide and no doubt goes back to ancient times. 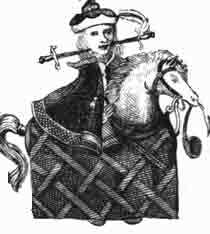 However the ancestry of the English Hobby Horse can, at best be traced back to the sixteenth century when we come across references to men and boys capering round dressed as tourney horses ( a frame carrying a horses head at the front and a tale at the back, draped in fabric and worn about the waist). The setting for these performances was at first the kind of tournaments, masques and pageants that the Elizabethan court delighted in. As today Royal patronage was a powerful trend setter and similar celebrations were taken up by civic authorities and trades guilds. In the latter half of the sixteenth century processions around towns as large as Norwich and as small as Banbury could be seen, including in the line up hobby horses and morris dancers. As the popularity of these events began to wane the hobby horse operators and the morris dancers formed an unofficial alliance and perpetuated a practice which had become a useful way of raising a little extra income. As the seventeenth century wore on pressures from puritan communities and other economic and social factors lead to a further reduction in the number of performances seen and the dancers and horses retreated in many cases to rural communities where they could be considered to be out of sight and out of mind! The heartland for morris dancers became the Cotswolds where by the mid nineteenth century there was something like one hundred and fifty different teams in operation, the nearest being Adderbury. The hobby horses had fled to even more remote parts such as the coastal villages of Minehead and Padstow in the West Country. Other forms of horse and animal disguise of doubtful origin such as the Hooden Horse in Kent and the Mari Llwyd in South Wales also lingered in remote communities. Even these few remnants of traditional festivities were in danger of dying out at the start of the twentieth century when academics of various persuasions started to take an interest and collect information about what they, erroneously, saw as relicts of ancient pagan customs. Their efforts lead to a revival of interest in folk music and dance which has continued to this day. The revivalists also reunited the morris dancers and hobby horses to form a new spectacle. Interestingly enough there are probably more hobby horses and certainly more morris teams performing now that at any time in the nations history!